Inject texture and body to second-day hair with Fudge Reviver Dry Shampoo, a lightweight cleansing formula that adds instant lift. Enriched with Rice Starch to absorb excess oil and Apricot Kernel Oil to replenish vital hydration, the formula helps to smooth frizz and flyaways whilst delivering volume at the roots. Expect clean and healthy-looking hair in seconds. 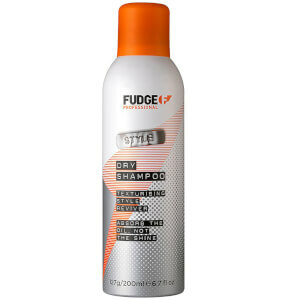 Spray Fudge Dry Shampoo directly onto the roots and massage into the scalp using fingertips. Wait 2 minutes, then brush through the rest of the hair to feel dry cleaned and fresh. Butane, Isobutane, Ethanol, Propane, Aluminium Starch Octenylsuccinate, Oryza Sativa Starch, Prunus Armeniaca (Apricot Kernel Oil), Disteardimonium Hectorite, Isopropyl Myristate, Parfum, Geraniol.